(or in the Venetian style), 17th cent. Corning Museum of Glass 51.3.118. Venetian cristallo is quite literally the glass that made Murano famous. Ultimately, royal courts and wealthy families throughout Europe coveted glassware of this type. It had the clarity of its namesake mineral, rock crystal, and its working properties were such that one could make extremely thin, yet complex pieces. At a time when glass made from dirty sand and fireplace ash was churned out cheaply and quickly around Europe, cristallo was the absolute pinnacle of the glassmaker's art. 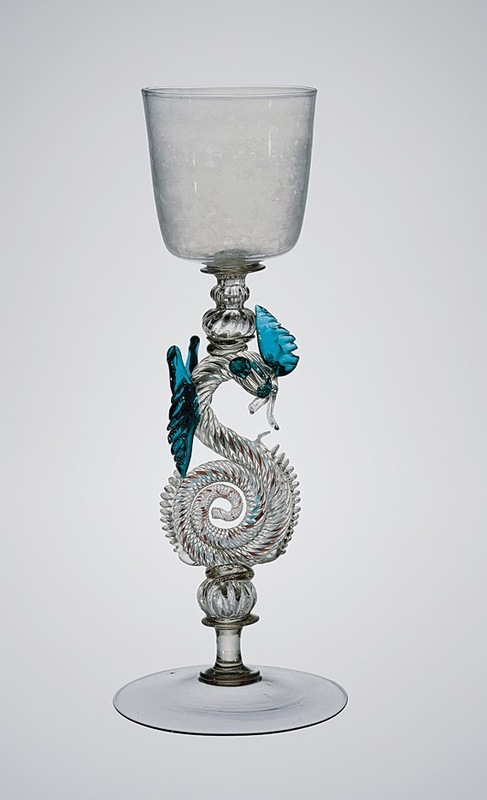 Murano glassmaker Angelo Barovier gets credit for the development of cristallo around the year 1450. However, it is a mistake to think that suddenly, he exclaimed "eureka" and burst out of his workshop with an entirely new invention. The predecessor of cristallo was what Antonio Neri called cristallino, which already incorporated some of the advantages. Barovier may well be responsible for bringing together the ultimate refinements that elevated cristallino to a new level of perfection, but these techniques individually were all available and utilized by glassmakers at least fifty years earlier. Barovier had attended lectures by noted alchemist Paola de Pergola, at the School of Rialto. This indicates that he was thinking along the lines of a chemist in putting together a repeatable regimen for an exceptionally clear, bright, workable product. The real genius in cristallo was in controlling the purity and quality of all the materials through Venice's extensive trade network in the Mediterranean. Even if the recipe leaked out, exclusive trade agreements blocked access to the raw materials. Local ordinances tightly controlled source materials used in the furnaces to ensure consistency, from the quartz river pebbles crushed for frit, to the plants used to make the flux, to the manganese which eliminated any slight tinting. Requirements even stipulated the making of the furnace crucibles from a specific variety of clay from Constantinople. Barovier's innovation would become a tradition that would be carried on by countless glassmakers and ultimately by our Florentine priest, Antonio Neri, more than a century and a half later. Neri describes the Venetian methods, but then goes on to innovate with variations of his own. Numerous family manuscripts in Venice documented the method to make cristallo; what Neri did was to publish these relatively secret techniques and make them available to anyone who could read his book, and many did. For silica, the main ingredient in glass, Neri says the craftsmen on Murano specifically used quartz river pebbles (tarso) from the Ticino River in Pavia. He describes special procedures to pulverize the stones without contamination, into a powder "ground as finely as flour." Next, he makes the flux (glass salt), which allows the quartz to melt at lower temperatures. He says to use the ash of the kali plant from Syria (polverino and rocchetta). This plant ash is very rich in sodium carbonates; he extracts and purifies it in a process called lixiviation. Neri purchased the starting material in a charred state, which reduces it weight and volume for shipping. From 300 pounds of ash, he usually produced 80-90 pounds of salt. The ash was boiled in cauldrons full of water, strained, filtered, evaporated and dried leaving the all important glass salt. Into each cauldron, he mixes ten pounds of tartar—the dried dregs scraped from the inside of red wine barrels—a material high in potassium carbonates. Today, we know the soda component is responsible for the favorable property of long working times for artisans before the hot glass stiffens, the potassium adds sparkle. The final ingredient was two pounds of lime (calcium oxide) per one hundred pounds of salt, which is added to the dry salt because it is not water soluble. This stabilized the glass against future degradation by moisture over time. 200 pounds of powdered quartz mixed thoroughly with 130 pounds of the salt forms the basis of the frit. He raked the powder around in a hot kiln for about five hours, until "nut sized" pieces began to form. Now this cristallo frit,—which Neri calls bollito—was carefully packed to remain dry and allowed to age for three or four months, when it was ready to melt in the furnace. If the glass should have a slight green tint from iron tools, it was corrected with manganese (oxide), specifically mined in the Piedmont region. The cristallo was boiled for up to six days and repeatedly washed by ladeling the hot glass into cold water and then remelting. The result was a glass that was a pleasure for artisans to work and make finished pieces over which royalty clamored. Cristallo was uniform in consistency, it could be blown into molds or worked freehand into complex shapes, like the iconic "dragon goblet" form, which became a hallmark of the Venetian masters. In the Cathedral of Santa Maria and Donato on Murano, behind the altar, there is an unusual display of four very large bones found buried under the ancient church. Local folklore tells that the bones belong to a dragon slayed by Saint Donatus of Arezzo, the patron saint of the island. * This post first appeared here in a slightly shorter form on 12 February 2014.